. :KROS Car Rental Antalya Airport | Rent A Car Antalya | Hire:. This article is mostly about the Antalya City; for the province, see Antalya Province. Antalya is the capital city of the Antalya Province, located on the Gulf of Antalya on the Mediterranean coast of Turkey. The population of the city is 603,190 (2000 census) but reaches up to 2 million in summers at the height of the tourist season. Situated on a steep cliff, Antalya is a picturesque city surrounded by mountains, forests, mediterranean sea and many ancient ruins; with one notable archaeological museum. With its airport it is a gateway for Turkey's coastal resorts which took the name Turkish riviera because of the natural and historical beauties of it. 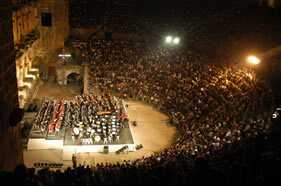 Combining history and culture it deserves the title of "the capital of Turkish tourism". Today the city of Antalya is reliving a golden age. It has been transformed into a cultural and touristic hub with thematic hotels with concepts like Venice, Topkapı Palace, and cathedrals in Moscow. Kaleici, the rustic old town where historic Turkish and Greek houses are under protection, is the most popular center in Antalya. It is situated between the yacht harbour and the main city. Old houses that are separated by narrow, cobble-stone roads are now hotels and tourism-related shops. Traces of Lycian, Byzantine, Roman and Seljuks architecture and culture can still be seen. Also Antalya museums house the finds belonging to historic ages of Anatolia. Inside the city Yivli Minare and Kulliye, Karaalioglu park are places where Ottoman architecture can be seen. Konyaalti and Lara coasts are well known with their crystal clear waters. The prominent sites accessible by daily tours are Side, Perga, Manavgat and Alanya. 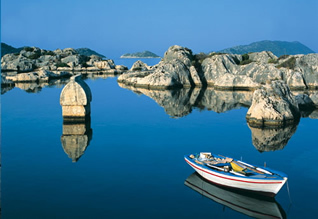 Ancient cities like Phaselis, Olympos, Adrasan and Kekova can be reached from the sea by Blue voyagers. In the 1st century BC, the Pergamum king Attalos II ordered his men to find the most beautiful piece of land on earth; he wanted them to find "heaven on earth". After a long search all over the world, they discovered this land and said "This must be 'Heaven' " and King Attalos founded the city giving it the name "Attaleia" (Greek: Αττάλεια) which later became Adalia and then Antalya. Evidence of human habitation dating back over 200 000 years has been discovered in the Carain caves 30 km to the north of Antalya city. Other finds dating back to Neolithic times and more recent periods show that the area has been populated by various ancient civilisations throughout the ages. Records from the Hittite period refer to the area as part of the "Lukka Lands" (from which "Lycia" is derived) and document the lively interaction going on between provinces in the second millennium BC. Like their descendents, the Lukkans were known for their seamanship (especially their piracy) and demonstrated a fiery independent spirit. Neither the Hittites, nor the kingdom of Arzawa on the west coast, could ever keep them at peace for long. Historical records document how cities developed independently, how the area as a whole came to be called Pamphylia and how in Classical times a federation of cities was set up in the province. There are also tales of the migration of the Akha clan to the area after the Trojan war. Antalya had entered the sovereignty of Lycian Kingdom from 7th century BC. The reign of the kingdom of Lycia in west Anatolia came to an end in 560 BC after it was defeated by the Persians during the battle of Sardis in 546 BC. The Macedonian commander Alexander the Great stoped the Persian rule and in around 334 BC Alexander the Great conquered the cities of the area one by one - except for Termessos and Sillyon which managed to repulse his armies in 333 BC. Antalya itself was founded later. With the death of Alexander in 323 BC, a long battle erupted between his commanders that lasted until 188 BC. With the defeat of the Seleucid army at Apamaea began the reign of the kingdon of Pergamom. In 150 BC Attalos II, king of Pergamom, founded the city of Attalia (Greek: Αττάλεια—present day Antalya) to base his powerful naval fleet. When Attalos III, the last king of Pergamom, died in 133 BC he left his kingdom to the Romans. After that an era starts in the region that the pirates and small cities belonging to pirates play a major role. Christianity started to be spread in the region after 2nd century. During the Byzantine sovereignty, it is known that Antalya had a big development era until 5th and 6th centuries. In these centuries, Antalya had reached beyond the city walls. Starting from 7th century, the Muslim Arabs had started to be dominant in the region. The army of Louis VII. sailed thence for Syria in 1148, and the fleet of Richard of England rallied there before the conquest of Cyprus. Between the years 1120-1206, Antalya had agained passed under the sovereignty of Byzantines. 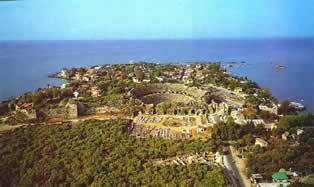 Antalya played a considerable part in the medieval history of the Levant. Kilij Arslan had a palace there. Conquered by the Seljuk Turks of Konia in 1207 A.D. and then Alanya in 1220 A.D. ending the Byzantine rule for the last time, and made the capital of the province of Tekke, it passed after their fall through many hands, including those of the Venetians and Genoese, before its final occupation by the Ottoman Turks under Murad II. (1432). The climate in Antalya bears the Mediterranean climate features. The mild weather conditions offer holiday possibilities in all seasons. Sometimes you can experience four seasons in one day in Kemer. 300 days of the year are sunny. This causes Antalya to be one of the few cities in Turkey to use solar systems for energy needs of buildings. In summer time it is rainless and hot. In winter time it is rainy and mild. No snow falls to the coastline of the district. The mountains in the north and the mild wind from the south are reasons why it usually goes never below 10 °C in this region. With the exception of a few weeks of rainy days, the seawater, which goes even in winter not below 15 °C allows you to benefit from the sea all year long. 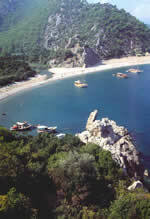 Main growth and development of Antalya started in the Republic era. While the town population was 17.635 in 1927, 27.515 in 1950, 50.908 in 1960,it reached 95.616 in 1970. The population which was 258.139 In 1980,reached 1.719.751 in the year 2000. It's magnificent nature, suitable climate conditions increased the migration to the city. While the migrations caused new districts in the city, it fastened the construction sector. The agriculture sector which showed development parallel with tourism, it caused transportation sector to be developed with itself. Kaleici: It is the historical center of the city which embraced many civilizations during time. It is now restored and has became a most attractive touristic centre with its hotels, bars, clubs, restaurants, and shopping. Kaleici retains all the original ancient Turkish archaeological characteristics. The port's marina has been completely restored. The restoration activities in Kaleici won the Golden Apple Prize, the Oscar of tourism. The City Walls: The memorial Hadrian Arch and The Clock Tower are remarkable and date back to Hellenistic era. Antalya Museum: A prize winning museum and one of the most notable archaeology museums, of the world. It is also the only museum in Turkey with a children's department exhibiting ancient monuments appealing to children. Kaleiçi Museum: Opened by the Mediterranean Civilizations Research Center (Akdeniz Medeniyetleri Araştırma Merkezi) it is newly opened and already has a very rich collection. Hadrian's Gate: This ornamental marble arch was constructed in 2nd century BC by the Romans in honour of the Emperor Hadrian. Yivli Minare (Fluted Minaret): This fluted minaret of 13th century was built by the Seljuks. Decorated with dark blue and turquouise tiles, the minaret eventually became the symbol of the city. Karatay Medresesi, Hidirlik Tower, Ahi Yusuf Mescidi, Iskele Mosque, Murat Pasa Mosque, Tekeli Mehmet Pasa Mosque, Balibey Mosque, Musellim Mosque, Seyh Sinan Efendi Mosque and Osman Efendi Mosque are other important places in the city.